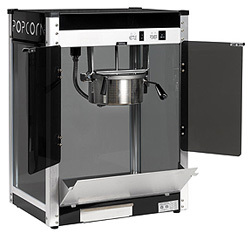 Paragons Contempo Six popcorn #1106220 machine is features all the features of the larger machines. A small foot print and anodized aluminum kettle keeps the popcorn coming. 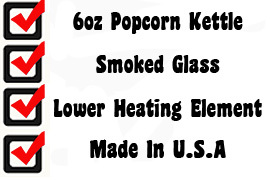 Best of all, it's black frame and smoked glass, bring a contemporary look to a popcorn machine.A lower heating element keeps the popcorn warm all day and the old maid's pull out drawer keeps the unpopped kernels from getting into the popcorn. The Contempo six popcorn popper features witches are on the back of the machine for easy operator use. This machine offers a three year warranty. 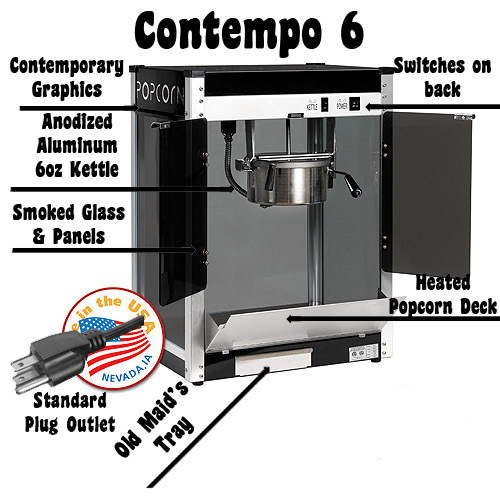 Paragons Contempo Six popcorn #1106220 machine is features all the features of the larger machines. A small foot print and anodized aluminum kettle keeps the popcorn coming. Best of all, it's black frame and smoked glass, bring a contemporary look to a popcorn machine.A lower heating element keeps the popcorn warm all day and the old maid's pull out drawer keeps the unpopped kernels from getting into the popcorn. The Contempo six popcorn popper features witches are on the back of the machine for easy operator use. One year warranty. With the standard lower heating element and "Old Maid's Tray", the six will provide an ample supply of popcorn that will stay fresh throughout the day. This feature is found on all machines six and higher. Although the Contempo 6 is economical to purchase and operate, it looks really cool!! While it uses the latest technology to insure years of service. Complete with Paragon's exclusive three year warranty.